NOTE: Ciena is the latest breakout from my Technical SetUps WatchList which is emailed out each market morning at 8AM in my Stock WatchList Morning Update. Learn more here. Shares of CIEN continued trading higher this past week, adding another +5%. I have to note two important technical concerns with this holding. 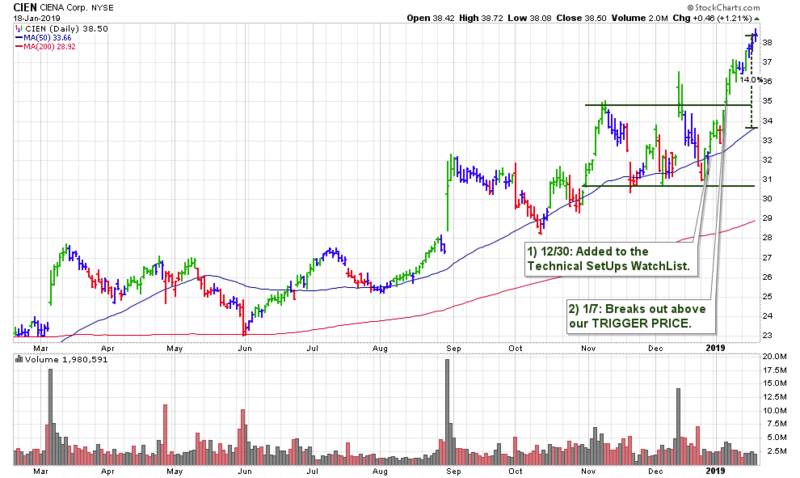 One, is that the breakout and the portfolio gains of +9.5% have been with a lack of volume conviction. Two, shares are now extended, being +33% above the 200 DMA, with no real significant support until the 50 DMA which is more than -10% below Friday’s close. Any weakness in this selection would be a time to take at least a portion of profits. SUN 1/13 UPDATE: We had CIEN, from the Technical SetUps WatchList, also break out on Monday. As noted mid-week – “Volume was not as much as we normally like to see, being only +15%, however, lower volume breakouts can still work out in an up-trending market. However, shares are starting to get a bit extended, and swing traders could consider taking +4% profits here. There is no real solid support until possibly the 50-day moving average which is below the breakout price. Also, note that our 2nd SUPPORT is below our MAX STOP LOSS GUIDE. When those are inverse, that is not a good sign.